Summer or not, we are slaving away at the CELL office in order to transcribe all the annotations contained in the books which are part of our Dee corpus! This blog post, by Finn Schulze-Feldmann, one of the three research assistants involved in phase 2 of AOR, reflects on Dee’s different annotation styles. 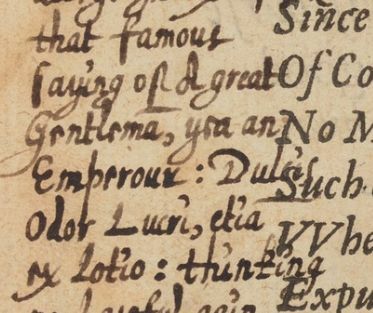 When transcribing John Dee’s marginal notes, one comes across many different styles of how to annotate a book. We all know some who consider books to be so sacred that their immaculacy shall not be tainted under any circumstances, and others who quite willingly leave their individual imprint on a book, scribbling their thoughts on the margin and highlighting passages in all the colours of the rainbow. If Dee had had different colour options available too, he would most certainly used them. 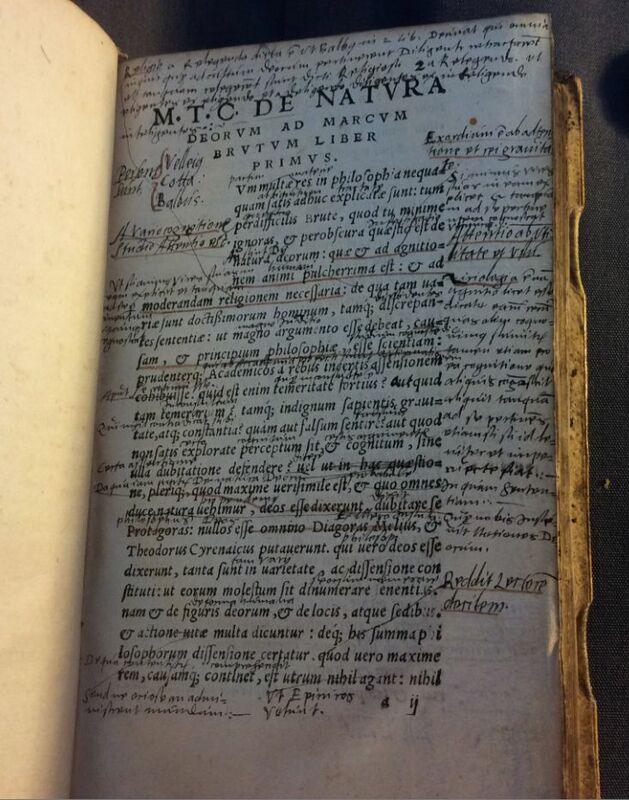 His copy of Cicero’s Pro Publio Quinctio is at first sight slightly overwhelming to say the least. 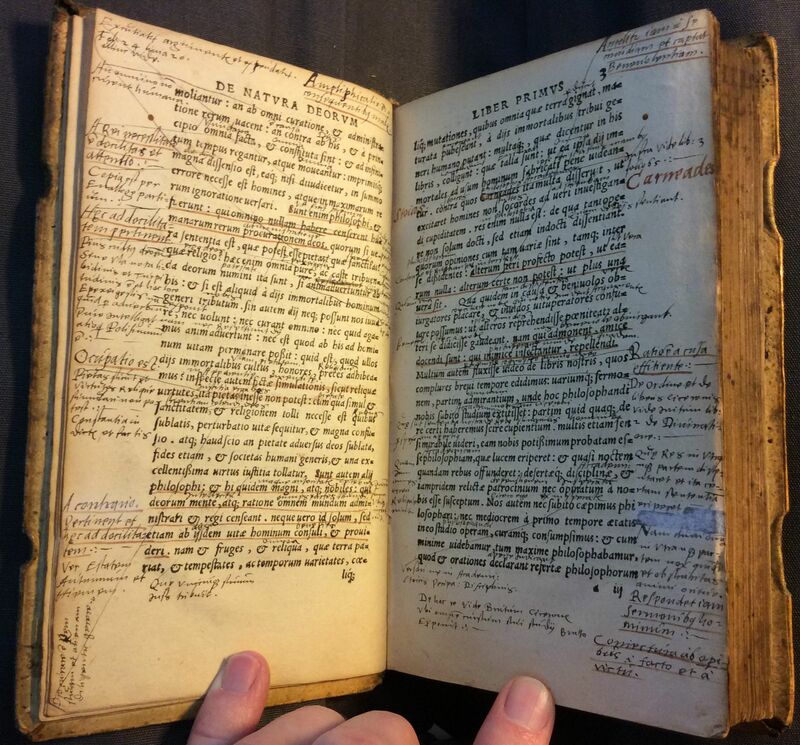 There are plenty of comments in the margins, heavy underscoring and various different drawings and symbols. Hardly any pages are left untouched. Thanks to these annotations we are able to gather some understanding of how a scholar as prolific as Dee worked. This is, of course, not to say that Dee subjected all his books to such excessive treatment. Quite the opposite! 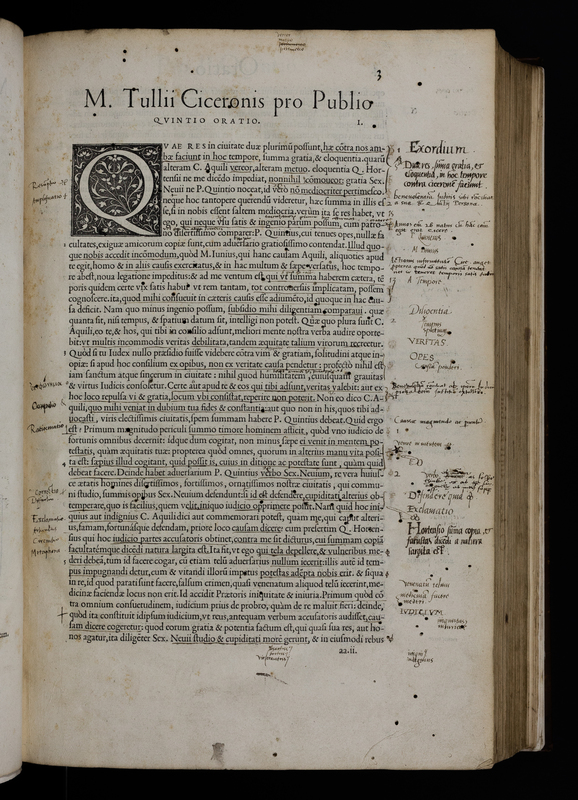 His copy of Quintilian’s Institutio oratoria could serve as an example in any modern-day handbook on how to read, highlight and annotate texts. Measured and never in a way that the reader could not grasp them immediately, the annotations are a guide through the text – and a delight for those transcribing them. 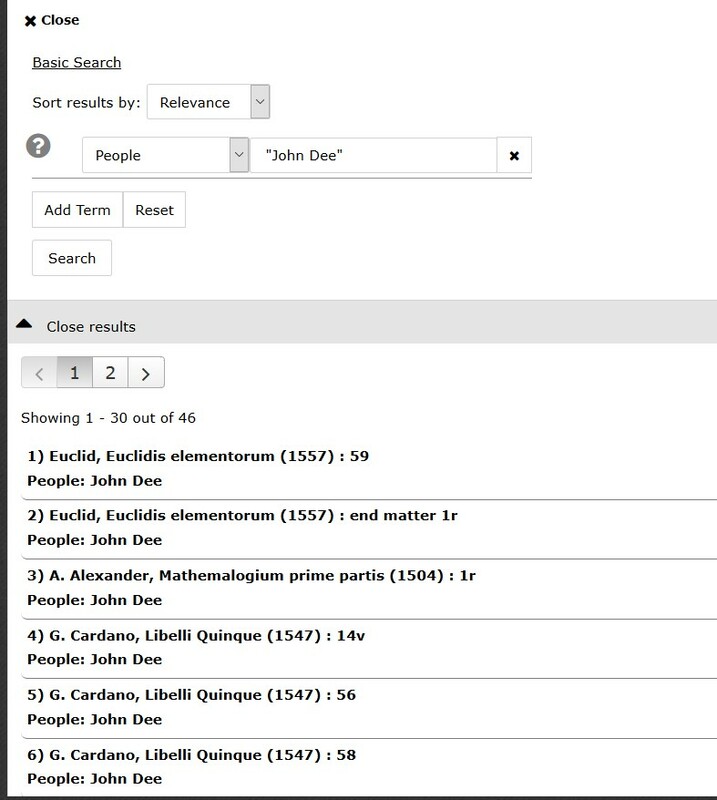 They reference other works of Cicero, number lists mentioned in the text and provide brief summaries. Thus, to navigate through the text is made an easy task. And then there is a third kind of annotations. Scattered through all his books, there are some that might be of interest not so much for their scholarly purposes, but rather they allows us to get closer to John Dee the person, or shall I say, the artist? Dee used not only to annotate books, but also to draw in books. Admittedly, the majority of his drawings mark names in genealogical trees as kings or queens. But there are also the odd ones that are a bit more playful. One of my personal favourites is a face that is seemingly randomly drawn in a margin of Dee’s copy of Matthew Paris’s Flores historiarum. Their entertaining effect aside, the different ways in which Dee annotated his books do pose questions regarding their purpose and use. 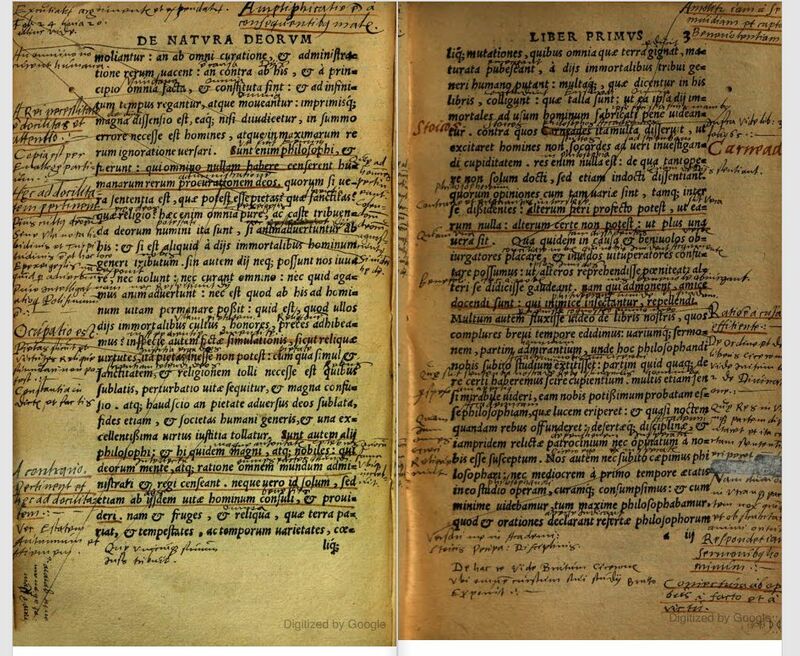 Would anyone but Dee be able to make sense of his densely annotated Cicero volumes? They seem to contain different layers of annotations. Those in a neat hand would still help a modern-day reader to find their way around the text. Others such as notes confirming or rejecting what is written and references to other works bear valuable insight in Dee’s intellectual engagement with the text. 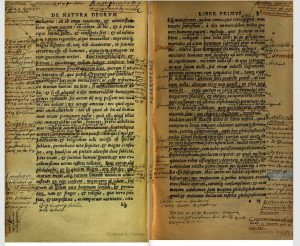 Especially the Cicero mentioned above appears to be a book he had read over and over again, each time with another focus. A rich repository for generations of researchers to come, none of Dee’s contemporary, I suspect, would have benefited much from these. As the printed text itself is at times even obscured by the marginalia, this volume seems dedicated to private study alone. 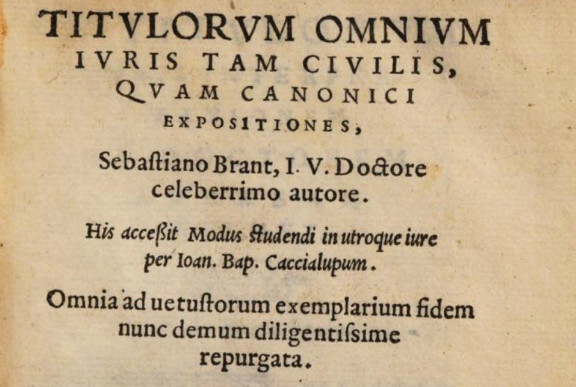 In contrast, it would not be much of a surprise if the well-measured and neatly written notes in the Quintilian were indeed intended to be read by others. They are instructive and insightful. That Dee had allowed himself a little digression by drawing random faces and crowns, readers both today and in the past may smilingly excuse. For the past few days, I have gone down the rabbit hole of worldwide library catalogues in order to actualise the status quaestionis of Gabriel Harvey’s library. The last cohesive attempt dates back to Virginia Stern’s book Gabriel Harvey: his life, marginalia and library from 1979. But books are nomadic objects. Like so many early modern collections, Harvey’s books have not stayed together, and since 1979 have either moved to different shelves, some surfacing from the private depths of the bibliophile world, while others were last seen in auction catalogues before disappearing entirely. What further complicates this task is that we can really only make educated guesses as to how many books Harvey’s library consisted of. Rough estimates range from a few hundred to well over a thousand. The corpus that I have reassembled so far (of course standing on the shoulders of Stern and others) consists of roughly 160 books of which I am confident what shelf they are currently on. They will provide a wider context for the AOR corpus. Geographical context also applies here, as there are traces of Harvey’s library in more than twenty libraries across the world—usual suspects like the British Library and the Oxford and Cambridge college libraries but also, for example, the National Libraries of Wales and Australia, and various institutions across the United States, most predominantly the Folger Shakespeare Library and Princeton University Library. An additional complication is that catalogues of smaller libraries and collections, such as the Rosenbach Library and the collection of the Saffron Walden Museum, are often not electronically available. The diaspora of Harvey’s library is absolute: a catalogue of his books can only be provisional—we never know how many books are still unfound. One such book that has recently become available and that already has been written about in our previous blog posts is Harvey’s copy of Thomas Tusser’s Fiue hundred pointes of good husbandrie, now residing at Princeton. In our corpus of thirteen it is not so obvious, but when zooming out to the (known) spectrum of Harvey’s whole library, Fiue hundred pointes becomes more evidently peculiar. In a collection of mostly political, historical and legal works, a practical calendar for countryside living – in rhyme! – seems out of place. Tusser’s Hundreth pointes was a popular book from the moment it was published in 1557. It was reprinted so often that the London-based publisher Richard Tottel decided to expand the book into a larger volume, Fiue hundred pointes, with the addition of hundreth good poyntes of huswifery. Harvey’s copy is a reprint from 1580, the year Tusser died. It stands out in Harvey’s library because of its subject, but also because of its genre: Fiue hundred pointes is a long poem that offers minute advice on how to live the pastoral life in accentual anapaestic, and predominantly in a-b-a-b rhyme. It’s a plain and sometimes grating style, but it is an easy meter to remember. Such rhymes were efficient instructional texts. Tusser’s farming manual was still being used as a teaching text in the eighteenth century, and some of its adages survive today: for example, “A fool and his money are soon parted” or “What a greater crime than loss of time.” Harvey gladly contributed in the margins of his copy quotations he picked up; for example, somewhere in the first pages he adds: “Dulcis odor lucre, etiam ex lotio” (“Profit smells sweet, even from urine”). 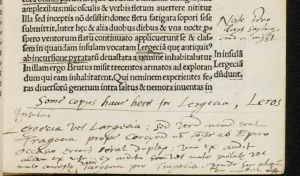 Harvey’s marginalia don’t mention Tusser’s stylistic or literal qualities. But in some of his first few annotations, Harvey does give this book a place in his library. He draws parallels between Tusser and the works of Xenophon, Hesiod and Virgil before recommending Fiue hundreth pointes as both useful for the economist and pleasant for the philosopher. Throughout his marginalia he refers to the classics, and continues to reference points of specific economic and political interest. Harvey’s marginalia make Tusser’s book seem less outlandish in the corpus. 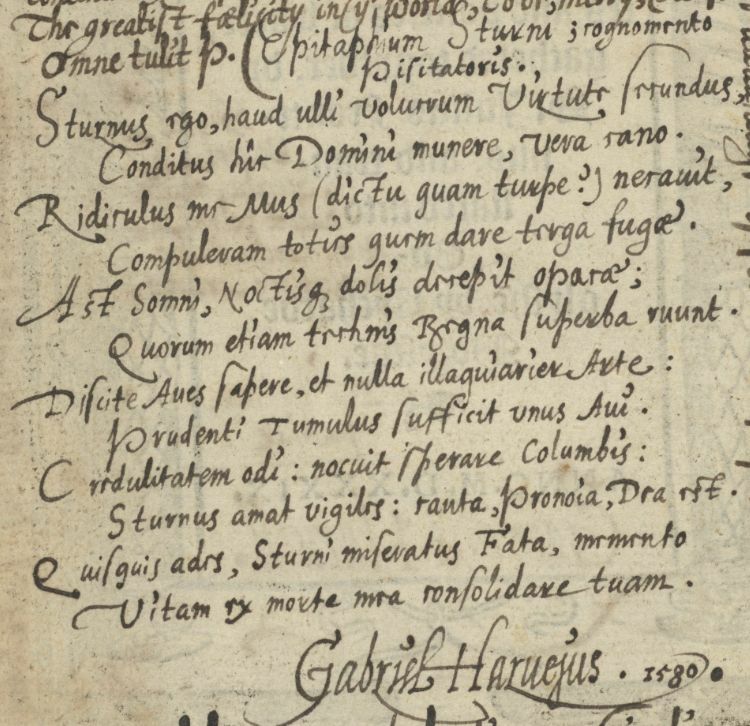 Harvey’s poetry in Latin shows his love of wordplay, puns, and ironic wit. It is showcased in his Gratulationum Valdinensium (1578), a series of poems dedicated to Elizabeth I. But, as one contemporary succinctly put it, Harvey was “more potent in his venom than in his honey.” His vitriolic pen worked considerably better than his other pens, as illustrated in his Three proper and familiar letters (1580). His love for the classical dactylic hexameter made his verse look and sound like that of a poetaster: dogmatic and a little awkward. How different was his approach to English verse! His unpublished experiments with English hexameters show a much more flexible approach: “to reform our English verse and to beautify the same with brave devices . . . lie hid in shameful obscurity,” he wrote to Spenser. Only a very select group of Elizabethan poets risked trying their hand at imitating the classical meter in the vernacular. Harvey’s fellow experimenters—Spenser, Ascham, Sidney, and Thomas Watson—conversed at large about the rules for an English hexameter system, but Harvey was less enthusiastic. He refused to comply with rules and committed only to the idea that the length of a syllable in verse should correspond to its actual pronunciation. But he did not divulge how English sounds were to be measured. Harvey may not have filled the margins of Fiue hundreth pointes with remarks on its style and verse, but he was always attracted to the stylistic aspects of the texts he read. 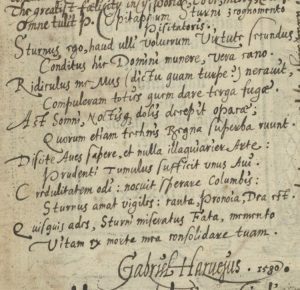 The AoR-team has spent a long time on a marginal annotation in Harvey’s copy of Frontinus’ Strategemes of warre (1539), that serves as a showcase of Harvey’s wit and love of puns (many thanks to Arnoud Visser for helping us out!). It is the epitaph of a sturnus, a starling. At the same time it is a warning to those to whom trust and hope come easily: “nocuit sperare columbis” is translated liberally as “Hopeful pigeons get hurt”! In a book about cunning war stratagems, this annotation is not out of place, but it is clearly very carefully crafted. It is also not so straightforward. The Latin is a little off and unlike Harvey’s usual language. It is bursting with puns and obscure references, and therefore a prime example of the horrors of translating a proud humanist’s Latin. The first line, for example, “Sturnus ego, haud ulli volucrum Virtute secundus,” is a play on “Turnus ego, haud ulli veterum virtute secundus,” a line from a speech by Aeneas’s greatest enemy, Turnus, given to him by Virgil in book XI of the Aeneid. Other seemingly odd phrases are yet to be traced back to the sources Harvey used for inspiration. The Sturnus epitaph shows how Harvey approached language: with craftsmanship. He says as much in his correspondence with his fellow experimenters with the English hexameter. Literary and lyrical endeavor for Harvey is a craft rather than an art or a “pastime for educated gentlemen”; the writer is an artisan, a “smith of words,” rather than an artist. For Harvey, in the end, writing is as much a craft as working the fields. Today I’d like to look at one of the especially tricky problems in transcribing Harvey, a symbol that has appeared twice so far in our corpus. It looks something like the letter Greek pi with a wavy line above it. 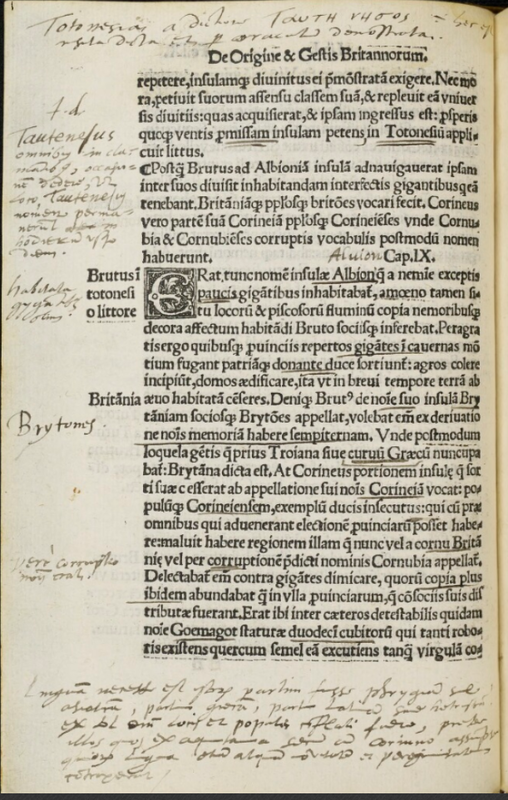 The first text that contains this symbol is Thomas Freigius‘ Paratitla seu synopsis pandectarum iuris civilis (printed 1583), a summary of the Digest (also known as the Pandects), a 6th century compendium of Roman law that became the foundation for developing legal systems throughout Europe in the early modern period. This chart, with the pi symbol on the left side, appears on a blank page before the text proper begins. 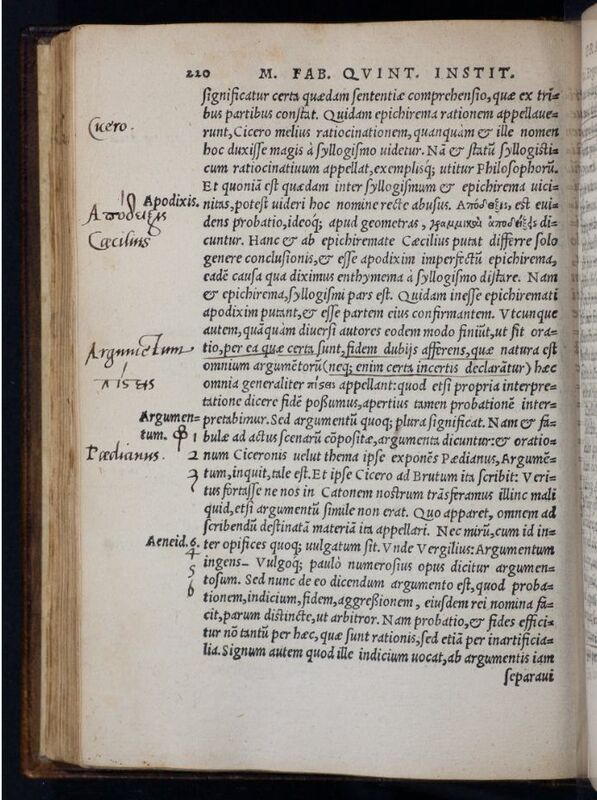 It appears to be a graphical representation of the division of the Pandects according to Freigius’s own summary. Perhaps the symbol is an abbreviation for the Pandects? Harvey was trained as a lawyer, but would he have used this symbol? With just this single example, it is difficult to come to any conclusion, but if we analyze the other example, we can begin to formulate a more substantial hypothesis. Juramentum, maximum litium expediendarum remedium. 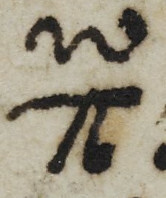 π.de jurejur.l.1. Et omnis Controuersiae finis. Decretal.c. Etsi Christus. eod. Due to my ignorance of early modern law, my first approach to making sense of this note was rather banal: Google. 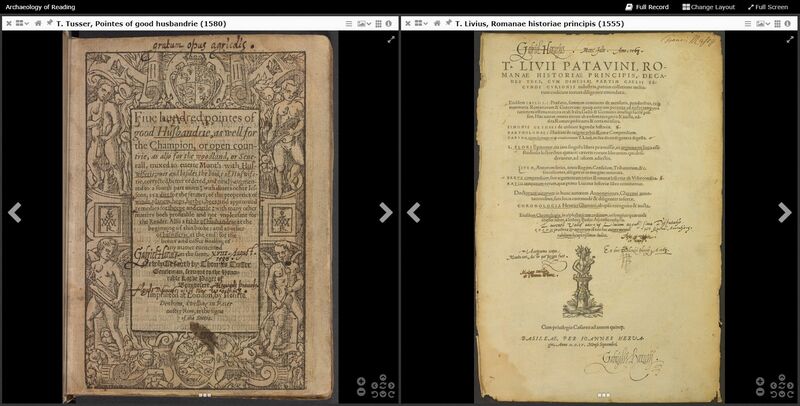 But given Google’s massive efforts to digitize early modern books, a simple search can return some incredibly useful results. For example, searching for “iuramentum maximum litium expediendarum remedium” immediately gives us a work that provides a brief summary of all the sections (or titles) of both civil and canon law. 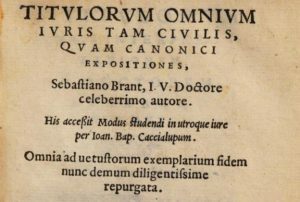 Here we have a 1562 edition of the Titulorum omnium iuris tam civilis, quam canonici expositiones, that is, explanations for all the titles of civil and canon law. 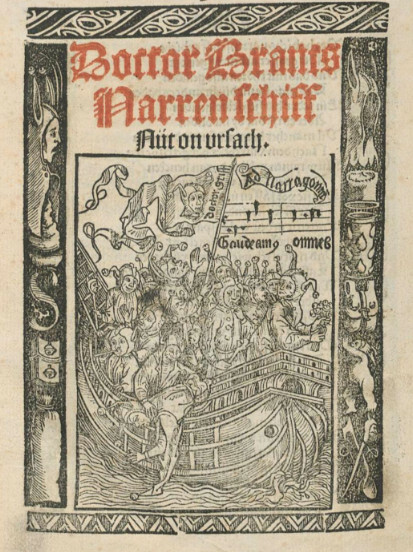 This work was composed by the German humanist Sebastian Brant, perhaps more famous for his satire Ship of Fools. Perhaps Harvey himself had a book such as Brant’s before him while he was annotating Olaus’ book on Swedish traditions! If we leave behind Brant’s book and search for the title “De iureiurando” in the full texts of both the Pandects and the Decretalium (also found on Google Books), the abbreviations start to make even more sense. 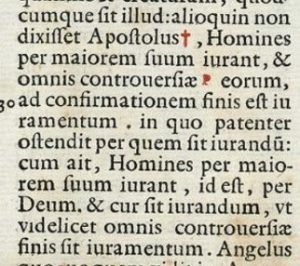 In reality, this passage appears in a chapter (also known as a caput) that begins “Et si Christus,” which helps us make sense of the citation “c. Et si Christus.” It is clearly a way of helping a reader find a certain section by referring to the opening words. To this is added an abbreviated form of the title, and, normally, the first word of the fragment, frequently preceded by ‘l.’, for lex. 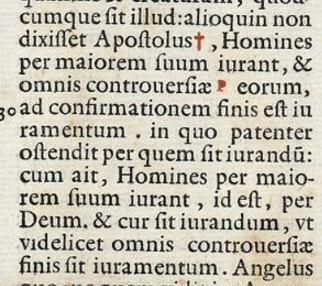 Many of the early printed editions also give an alphabetical listing of the first word(s) of the leges (fragments) in each of the parts of the Corpus. If the reference is to a fragment that is in the same title in which the reference occurs, eo. (for eodem titulo) will be substituted for the name of the title. c. & si Christus infra eod. This exact same method of citation can be seen in Harvey, the only difference being that, while Brant’s compendium uses “ff” to refer to the Digest/Pandects, Harvey uses the pi symbol with the wavy line. Decretal.c. Etsi Christus. eod. – Decretalium, in the chapter beginning “Etsi Christus,” under the same title [i.e. “De iureiurando”]. Given that we earlier hypothesized that Harvey was using this symbol to refer to the Pandects, we now have even more convincing evidence. We also have an interesting point of departure for thinking about the ways in which Harvey may have been reading a description of Swedish traditions and customs. But I’ll leave that for another time! As mentioned earlier, the latest edition to the Harvey corpus is Thomas Tusser’s Fiue hundred pointes of good husbandrie (London, 1580), recently acquired by Princeton University Library. The book is different from the other books in the corpus in terms of its topic —husbandry, the management or political economy of the household— but also in its literary style. For, unlike the other books in the corpus, Tusser’s book is written in verse. This blog will assess whether or not this fact exerted any influence on Harvey’s reading strategies. First, let us see whether a fairly straightforward statistical analysis reveals any divergent reading patterns by comparing Tusser’s book to the other books in the corpus. 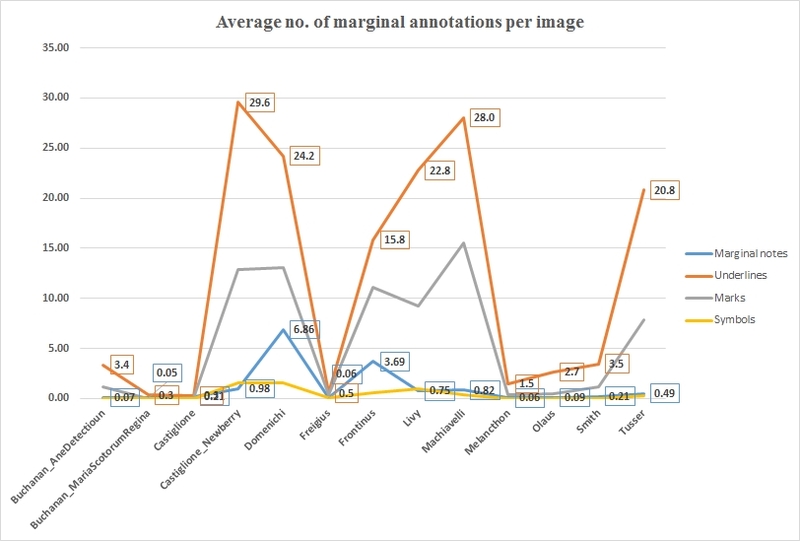 In the following graph I calculated the average number of marginal annotations (divided into the four main types: marginal notes, underline, mark, and symbol) per digital image. 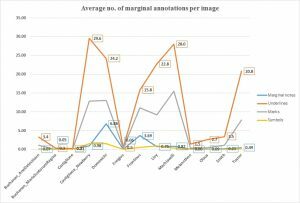 The figures show that Harvey annotated Tusser’s book fairly heavily—it is the sixth most densely annotated book in the corpus. It seems, though, that nothing out of the ordinary was going on. 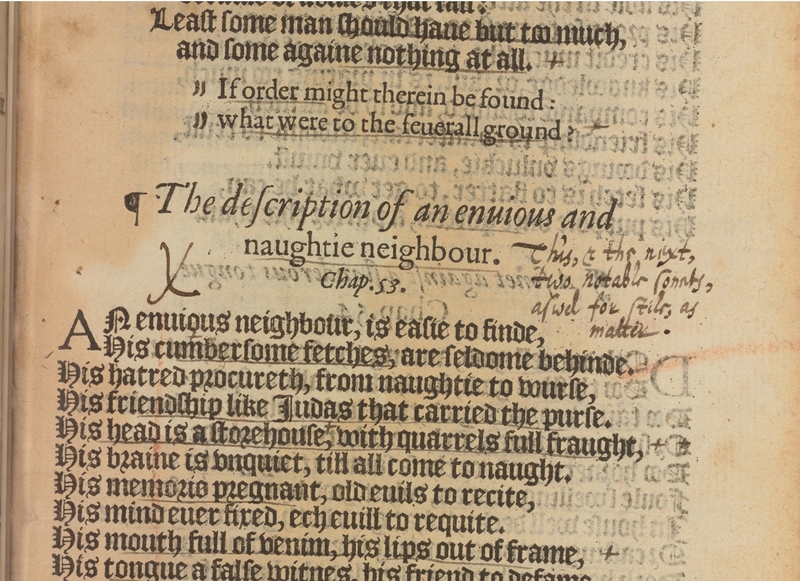 Harvey didn’t use a particular type of annotation more often than in other books, for example. The only thing that caught my eye is the fairly (but not extremely) high average number of underscores. The underline tag captures every word or sequence of words of the printed text that is underlined (as long as a set of words is underscored uninterruptedly), as a result of which the average number of underscores can be “inflated” when a reader underscored a lot of single words. Moreover, although working with the average number of underlines per digital image reduces the possibility of generating misleading statistics as the result of books being different in length (i.e., the number of pages), the different size of the book can still distort the statistics (e.g., a page of the Livy contains more words, and hence possibly more underlines, than a book in octavo format). We therefore should not take the statistics at face value: they can be misleading, as they have been influenced by various factors, including the size of the book and our transcription practices. 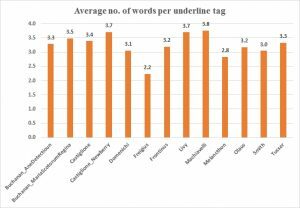 In the following graph we break down the number of instances of underscoring in the printed text further and show the average number of words per underline tag. As the graph shows, Harvey seems to have been remarkably constant in his underscoring practices across the corpus. 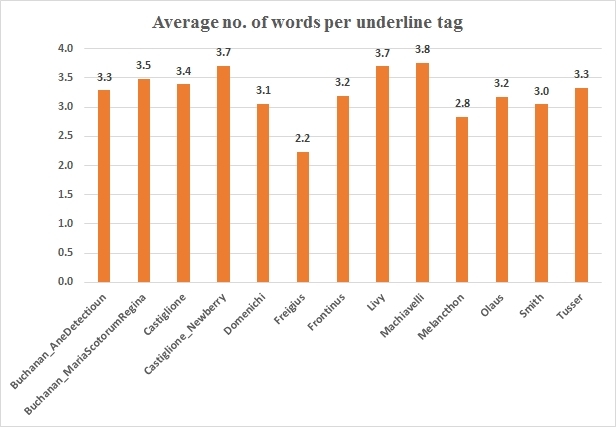 Whereas the total number of instances he underscored one or more words in the printed text varies greatly per book (from 48 in Buchanan’s Maria regina Scotorum to a whopping 26,088 in Livy’s History of Rome), the average number of words he captured by underscoring part of the printed text actually is quite similar (the only exception being Freigius’s Paratitla). These statistics thus seem to indicate that Harvey did not interact with the printed text of Tusser’s Husbandrie in a different way. Of course we could supplement this analysis with a more thorough linguistic scrutiny of the data, for example, focusing on the classes of words that are underscored. This falls outside the scope of this blog, so I just mention the possibility here. We should complement our research with a more qualitative analysis of the AOR data set, though. In my opinion, statistics can be extremely useful in laying bare patterns that would have been difficult to discern with the more traditional scholarly methods usually associated with analog research environments. However, digital environments allow us to fruitfully combine quantitative and qualitative analyses. 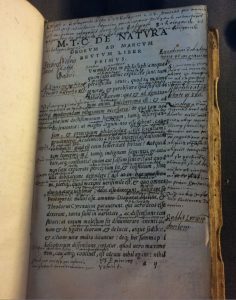 In this particular case, let us have a look at whether the marginal notes contain comments on, for example, the literary style of the book, or whether he frequently used particular symbols, such as Mercury, which Harvey used to mark passages in the printed text about eloquence (and also trickery). To start with the Mercury symbol, here’s an overview of the appearance of this symbol throughout the AOR corpus. 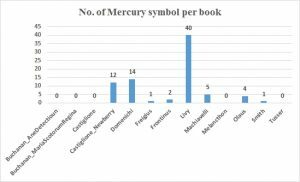 This path of inquiry clearly is a dead end, for the Mercury symbol does not appear once in Tusser’s Husbandrie. Moving on, neither did a simple search for “verse” yield a lot of results. In Tusser’s Husbandrie, Harvey did not mention this word in his marginal notes and only underscored the word “verse” twice: one time in the index at the end of the book, when referring to “Staints Barnards verses,” and the other time as part of the words “everie verse,” in the preface to the reader. In the other books in our corpus, Harvey did mention the word “verse.” For example, in Domenichi’s Facetei he wrote, “How many verses are there. 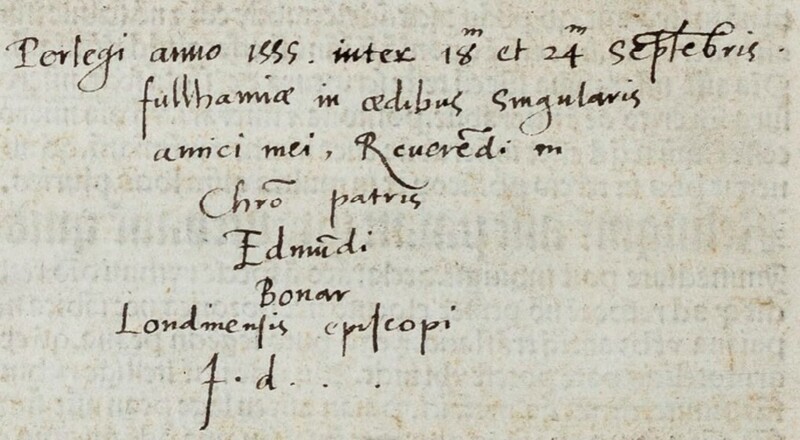 A 100,” and in Guicciardini’s Fatti et detti, “Hos ergo versiculos feci: tulit alter honores” (I wrote these little verses, and another man received the honors). In Castiglione’s The Book of the Courtier, Harvey underscored “foolish in verses” in a sentence that describes the foolishness of some men in particular activities. 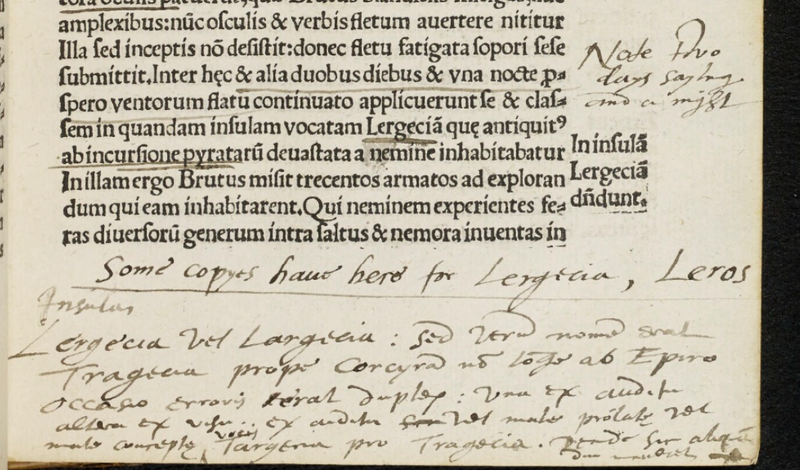 When examining Harvey’s other marginal annotations in Tusser’s Husbandrie, it quickly becomes apparent that many of them were written in the upper margin and summarized the content of a page or section, the marginal notes basically functioning as headers. Moreover, the notes comment on the content of the printed text, not on its literary style. Although we should take into account the facts that the data can be interrogated in many more ways and that our corpus is limited and does not include all books annotated by Harvey (including the book Chaucer’s The woorkes of our antient and lerned English Poet, Geffrey Chaucer, edited by Thomas Speght), on the basis of some limited quantitative and qualitative analyses of Tusser’s Husbandrie, we can tentatively conclude that Harvey was mainly interested in the practical knowledge contained in this book rather than in its literary qualities. In this sense, he did not treat Tusser’s Husbandrie any differently from the other books in our corpus. Given Harvey’s education and training as a lawyer, his usage of these technical terms is unsurprising. 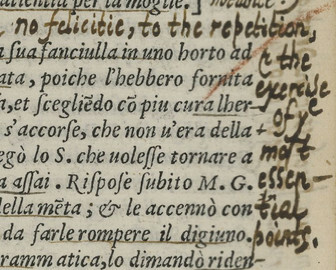 If we look back at the first image, the word appears next to the lines where we find a specific phrase, both underlined and marked with a plus sign: “usano dire i medici, che trovata la cagione del male, è facile trovar il rimedio” (doctors are used to saying that, once the reason for pain is found, it is easy to find the remedy). In the second example we find a similar reference to the cause or reason for something. 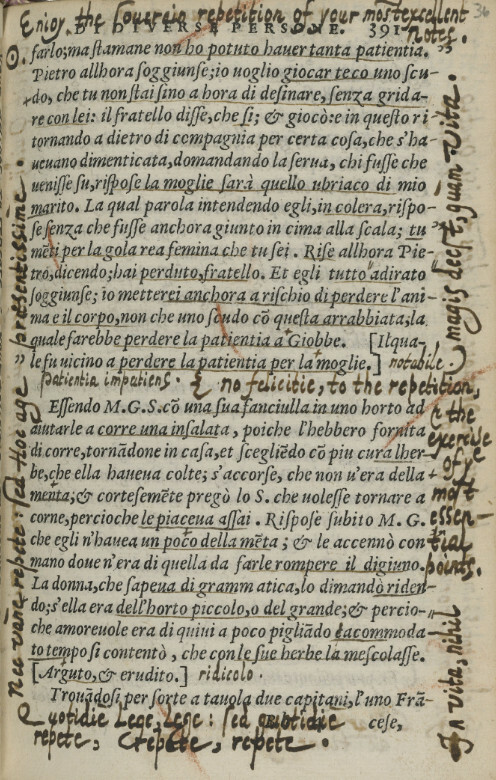 The Italian text (once more containing underlines and a plus sign) reads: “Diogene, domandato, per qual causa l’oro sia pallido, rispose: perché ei sa che ha molti persecutori” (Diogenes, when asked the reason for which gold is pale, responded: “Because it knows it has many persecutors”). In both cases, Harvey seems interested in the specific sort of knowledge being demonstrated through these phrases. 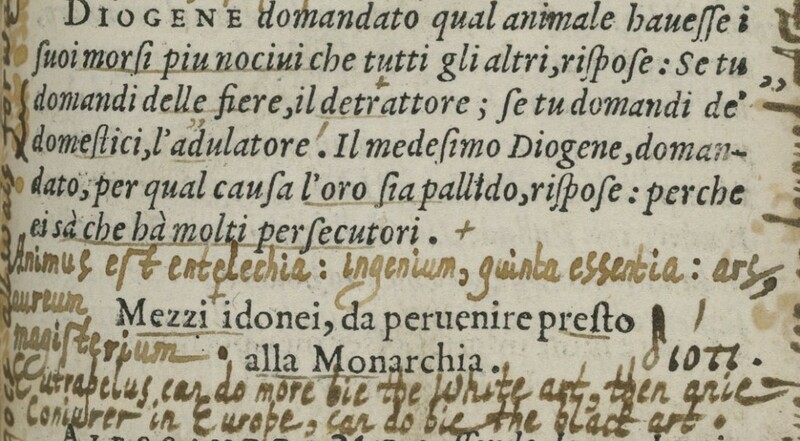 A third case may shed further light on his interest in this phrase (though it probably won’t provide us with enough information to exclaim “διότι!”) At the beginning of his massively annotated Livy, we find the word hiding down at the bottom, following the author’s prefatory note in which he explains the genesis of his history of Rome. In this instance, the word is qualified with “politicum, et polemicum” (political and martial). As διότι seems like it’s being used as a substantive, the meaning of the phrase is probably something like “the political and martial reasons why.” If we look at the text directly above this annotation, we find that Livy is asking his readers to attend to certain aspects of Roman history: “The subjects to which I would ask each of my readers to devote his earnest attention are these—the life and morals of the community; the men and the qualities by which through domestic policy and foreign war dominion was won and extended” (translation by Benjamin Oliver Foster, online Loeb edition). “The subjects to which I would ask each of my readers to devote his earnest attention are these-the life and morals of the community; the men and the qualities by which through domestic policy and foreign war dominion was won and extended” (translation by Benjamin Oliver Foster, online Loeb edition). It seems to me like Harvey is making a distinction concerning the sort of knowledge that Livy is offering in his history. The work will offer a “reason why” for the founding of the city of Rome and its subsequent development. The word also has a more figurative usage when referring to someone’s ability to discourse at length on a subject. However Harvey seems to be using a combination of the two; that is, his “descant” appears to refer to a sort of witty improvisation on a given subject matter. In both of the cases above, someone receives an insult before turning the phrase back on their interlocutor. I’m not sure that memorizing these works today would provide the same sort of urbane wit that Harvey was looking for. It certainly is an interesting list though. 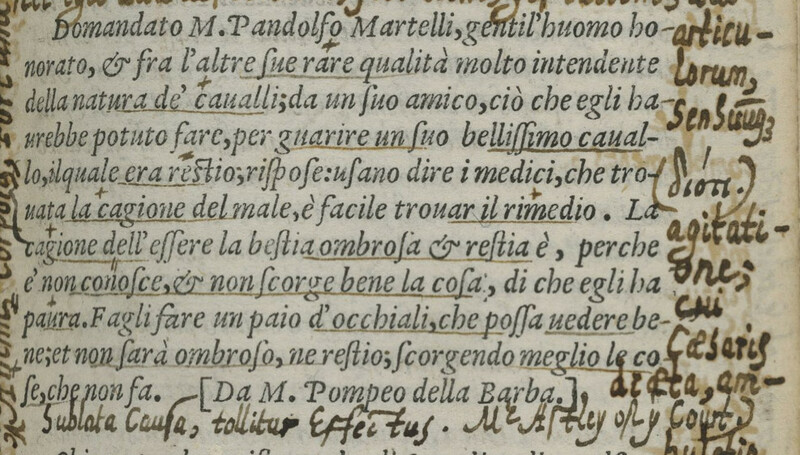 The complexity and density of the marginalia found throughout the Domenichi/Guicciardini volume makes it difficult to describe—let alone categorize—Harvey’s peculiar manner of annotation. As I mentioned in an earlier post, he doesn’t seem particularly interested in responding to the printed text. Originally, I referred to Harvey’s practice in this instance as that of writing a “manual,” ideally for the training of a gentleman of the court. I still feel that this is the case; that is, I feel that Harvey intended for his annotations to be not only read but also used by his reader as an aid to becoming a more virtuous person. One indication that the text is intended to be used can be found in the frequent repetition of names, book titles, and concepts in the form of digestible phrases, almost always in Latin. 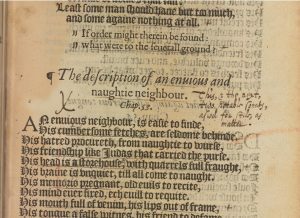 Harvey himself explains the pragmatic scope of this repetition in one of the few marginal notes that contains some degree of reflection on the activity of annotating. Farther down the page in the middle of the text, Harvey reminds his reader that happiness is not necessarily the goal of such activity. Instead, repetition is an essential form of exercise. Repetition in itself is not necessarily a useful activity; for it to be most effective, one must be “present”—that is, reading and repeating with with one’s full attention. This note also includes a phrase that will appear occasionally throughout the volume: Hoc age (Do this). Unlike in other instances of the word “hoc,” here Harvey capitalizes the letter h, lending a more abstract sense to the meaning of “this.” Rather than directing his reader towards a specific act, Harvey seeks a specific behavior and attitude: Do This—not in vain, but with as much presence as possible; Do This—and live well; Do This—and devour the sun. 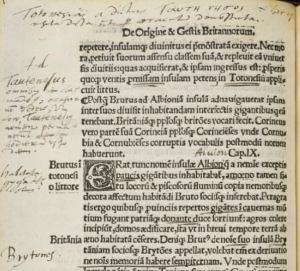 As a result of this insistence on reading, rereading, and contemplating marginalia as a means to practical ends, Harvey seems to have produced a sui generis form of writing. For lack of a better word, I have been calling it a manual, but the descriptive power of this label will always be partial. Much work still remains to be done on the form of the notes as a whole, which also involves making sense of the time periods in which certain marginalia were written. I mentioned in my last post that we can approximate dates ranging from 1580 to 1608. In fact, Harvey seems to have spent so much time on this project that he even had to remind himself to stop “scribbling” and simply enjoy the work that he had already produced. Transcribing all of Harvey’s annotations is not always an easy—let alone enjoyable—task, mainly because of his obsession for detail, as a result of which some transcriptions seem to be never-ending—or at least it surely feels like that. 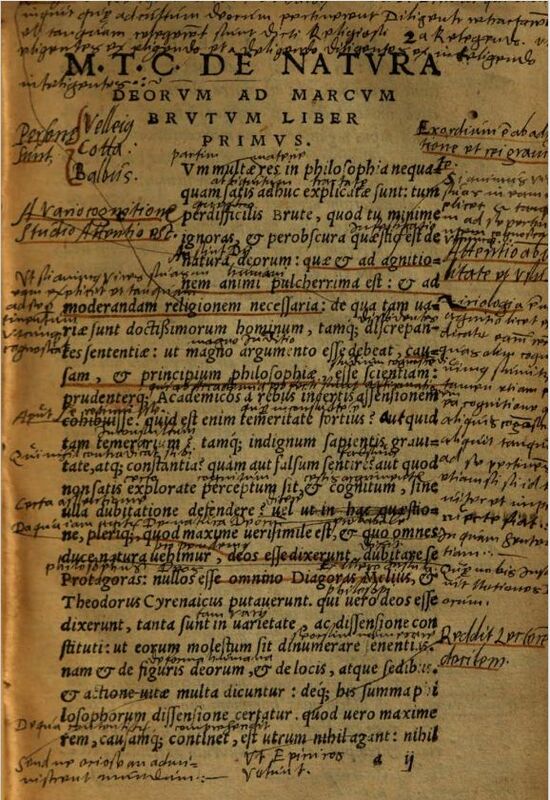 However, precisely because of this level of detail, when transcribing one sometimes encounters particular annotations that are likely to be overlooked when studying Harvey’s annotations, especially because we, almost reflexively, tend to direct our gaze to the marginal notes, which are seen as (and often prove to be) the richest and juiciest source of information. 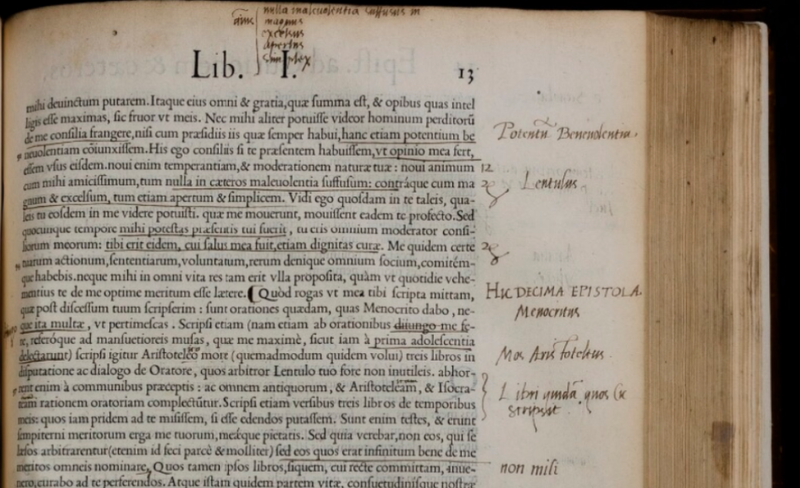 One of these particular annotations that attracted my attention are the words “pro se quisque,” which Harvey underlined in his copy of Livy’s history of Rome. I was intrigued by this, not so much because of the meaning of the words (“everyone for himself”), but because of the fact that Harvey underlined it with dots instead of a more or less straight line. This prompted me to add another variable to the method attribute of the underline tag, further expanding the search options. When continuing my transcription of Livy’s history of Rome, I was surprised to see that underscored the words “pro se quisque” more often; we have just finished transcribing Livy’s history in its entirety (!! ), and it turns out that he underlined this phrase twenty-five times. Most often he would just underline these three words (fifteen times), whereas ten times he underscored them as part of a slightly larger set of words. Underscoring these words by using dots, which initially attracted my attention, proved to be quite uncommon (only five times), as he normally preferred to use lines. Livy, Ab urbe condita, 454. Interestingly, the words “pro se quisque” are not just underlined in the printed text, but also appear in five marginal notes. In the first of these notes, Harvey wrote: “Everyone [strove] for himself, with no king at this time. The people favoured their power, the Senate its authority. The basis was of the people. Yet Romulus was the master and the common people were the slaves, just like here” (p. 9). The lack of strong leadership, and its negative repercussions for the Roman state, are echoed in other marginal notes as well: “For a nation that was the richest, most active as well as the shrewdest in the world it was not difficult to command kings and dominate the world. How many kings there are in one popularist city? Each one [strives] for himself.” Elsewhere he wrote: “The Roman offices served the use of the republic, not the grandeur of individual persons. Every one for himself, and those who cannot be Scipios abroad, want to be Petiliuses at home. And they have the nerve to taunt those by quibbling who they do not dare to rival by deserving well” (p. 689); and “A skillful move in a difficult situation. Everyone [strives] for himself, [see] above, below. Shyness in holding power and dealing with matters is for a boy, not a man” (p. 76). Harvey concluded that this had not always been the case throughout Roman history, “so that they [the Romans] were more prudent for themselves than for the Republic. For look wherever you wish in Roman history: everyone [strives] more for himself [my italics], than for the Republic; the devotion to the household is greater, than that to the fatherland; there are more rich and respected housekeepers than fair and wise politicians” (p. 63). Livy, Ab urbe condita, 63. The lengthy note continues on the next page, and Harvey argued that if the Romans had tailored their laws and political offices more closely to the nature of the Republic, this would have contributed to the well-being and stability of the state. This certainly was an important insight, and as the marginal note continued, Harvey wrote: “And for this consideration Philip Sidney, the prominent courtier, thanked me generously, and he openly acknowledged that he had never read anything of such importance either in historical or political works. That he had observed far and wide Romans who were too much senatorial in a popularist Republic and ones who were too much popularist in a Senatorial Republic, ones who were not royalist enough in a monarchy, citizens rather than subjects. And that he had no doubts whatsoever that if they had adapted themselves to the constitution of the State, that they would have come out as the strongest nation, the most successful and powerful people in the world. And this was our most important observation about these three books. . .” (p. 64). Here the full meaning Harvey attributed to the phrase ‘pro se quisque’ is disclosed: it denotes not only people striving for their own interests at the expense of the larger, public good, but also people acting contrary to the constitution of the Republic, disturbing its balance and harmony and creating internal turmoil. Here the full meaning Harvey attributed to the phrase “pro se quisque” is disclosed: it denotes not only people striving for their own interests at the expense of the larger, public good, but also people acting contrary to the constitution of the Republic, disturbing its balance and harmony and creating internal turmoil. 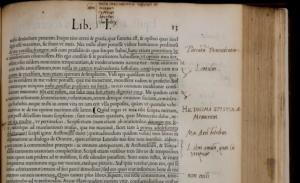 Interestingly, in only two of the other eleven books in our corpus did Harvey either mention or underscore the words “pro se quisque.” He did this in two marginal notes, one in Domenichi’s Facetie (**2[r]) and one in Guicciardini’s Detti et fatti (p. 48). In both cases, the context in which this phrase appears is different from the context (and content) of the marginal notes in Livy’s book. 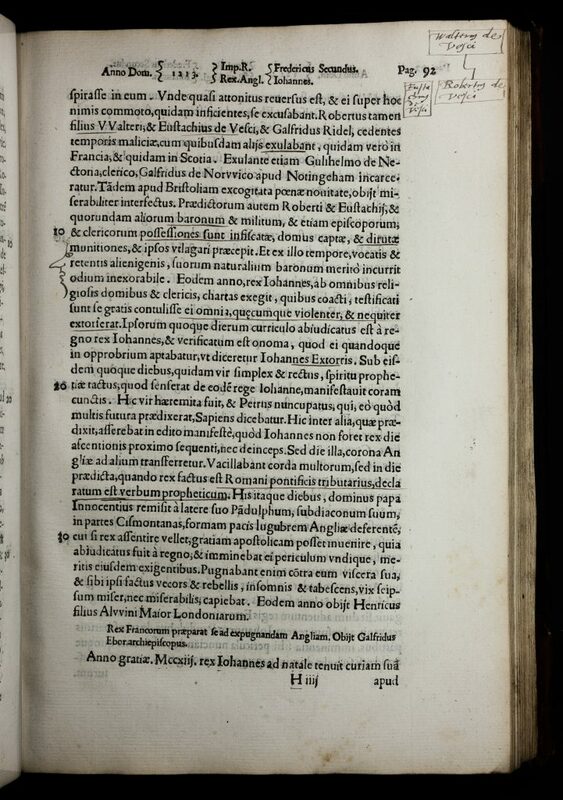 Although more research could be done—e.g., Did he underline all instances of “pro se quisque” in the printed text? What was the context in which this phrase was used in the printed text? Why did he use various forms of underlining? Are other marks used to highlight this phrase?—this example neatly shows the links between various forms of readers’ interventions, in this case underlining and marginal notes. For a transcriber, that’s probably the most valuable outcome of this small case study: it shows the benefit of having tagged all of Harvey’s interventions, which, if only for a moment, lightens the burden of what sometimes can be an arduous task.